Coke is a fuel used mainly in blast furnaces to reduce iron oxide to produce iron. It contains carbon, and is similar to coal. It is made from coal by cooking out things that are not carbon. Coke is a product of destructive distillation of coal. 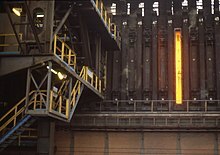 This is done in an airless furnace or oven (kiln) at temperatures as high as 2,000 °C (3,600 °F) but usually around 1,000–1,100 °C (1,800–2,000 °F). This baking drives off volatile parts of the coal, such as water, gas, and tar. Coke is an almost pure form of carbon. The calorific value (heat energy produced when a fuel is burnt) of coke is about 56,000 kilojoules/kilogram. Coke is used as a fuel and as a reducing agent in smelting iron ore in a blast furnace. The carbon monoxide produced by its combustion reduces iron oxide (hematite) to the iron product. Although coke is more expensive than coal, it can be used in households as a clean fuel, relatively free of smoke and impurities. At the present day its use in domestic heating has been less than oil or gas, but in the 20th century it was often used in kitchen stoves. ↑ "Coal and Steel". World Coal Association. This page was last changed on 13 April 2018, at 22:35.